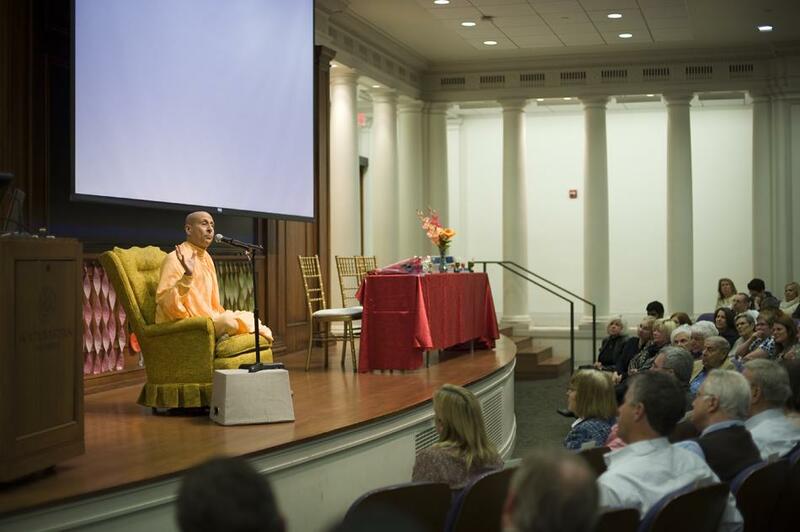 Radhanath Swami, a world-renowned speaker and social activist, discusses how his experiences affected his views on the roles of leaders within society Tuesday. The event, called “The Power to Lead,” drew about 150 individuals to Harris Hall. A world-renowned speaker and social activist spoke at Northwestern on Tuesday and discussed how his experiences shaped his view of the role of different leaders in society. The event, called ‘The Power to Lead,” featured Radhanath Swami and drew a crowd of about 150 individuals to Harris Hall. It was co-sponsored by several student groups including the Bhakti Yoga society, Engineers for a Sustainable World, Wild Roots, NCDC, Interfaith Advocates, among others. Radhanath Swami began his talk through discussing how the choices he made throughout his life affected his spiritual decisions. Radhanath Swami left his hometown of Highland Park, Illinois at age 19, when he traveled to Europe to spend a semester abroad. At the end of this experience, he said he was drawn to India, where, after several years of living in the Himalayan forests, he adopted a Hindu and Buddhist theology called Bhakti yoga. A few years later, he took monastic vows. Radhanath Swami attributes his decision to become a monk to his childhood experiences, pointing to his parents and uncle as role models. He said when he was growing up, his family often experienced economic hardships, followed by success. During his talk, Radhanath Swami stressed the importance of the inherent goodness in each person and the change that individuals can make in their societies. He illustrated this by recounting the story of an older woman he heard speak at an International Woman’s Day event in India last year. He said the woman frequently was punished for abandoning her chores to sneak off to school during her childhood. After she got married, she was brutally beaten by her husband when another man claimed she had been unfaithful. From that point on, she was homeless and fell into depression, contemplating suicide. During a suicide attempt, she heard an older man’s cry for help. In response, she chose to respond to the man and from then on, devoted her life to serving others. She went on to found an orphanage and took in more than 1,500 children, referring to each of them as her child. Evanston Mayor Elizabeth Tisdahl, Highland Park Mayor Nancy Rotering and SESP Prof. John Kretzmann also spoke at the event. Mayor Tisdahl explained that she was asked to speak at the event several months ago and when the organizers reached out to her, she was struck by their passion. She attributed this to the power of Radhanath Swami’s teachings. “To inspire that kind of excitement and pure joy in these young people is just as important as everything else,” she said. Weinberg junior Erik Linnell, who is involved in Bhakti yoga, said Radhanath Swami’s ideas on the importance of compassion in leaders struck him the most. During the conclusion of his speech, Radhanath Swami used a metaphor of two dogs, one good and one bad, both trying to get a person’s attention in an effort to highlight that individuals have free will to make their own decisions but can be influenced by leaders in one’s community.